Nicholas Paris first appeared in the city of Warwick in the year 1670 and worked there till his death in 1716. We do not know where he came from. The Paris surname does not occur previously in Warwick, and, though it is uncommon, it is found elsewhere in the county and it may be that he came from rural Warwickshire. This was where his apprentice, Richard Rittle, came from, about whom more later. His marriage to his wife, Mary, has not so far been traced, but their first child was baptised in December of 1675. Of his six children, only three survived infancy, all boys: Nicholas junior born 1681, John born 1685 and Thomas born 1688. They all followed their father in the metalwork trade. Nor do we know who had trained him, yet he became one of the finest and most versatile metalworking craftsmen of the seventeenth century. He made guns, clocks, wrought-iron gates and screens, which ranked along with the best in the land. Many of the facts about him were first ferreted out by the late W. A. Seaby, Bill to those who knew him, a former curator at Warwick and other museums and a keen researcher, with whom I often used to exchange notes. Bill was a kindly man, deeply interested in local history and in horology in particular, and would go to great lengths to help in any kind of research. Bill found that Paris's name occurs on the lists of those who paid Hearth Tax in 1670, 1671, 1673 and 1674 - in his case on three hearths. Also in the year ending at Easter 1670 he paid two shillings (10p.) for his seat in church 'for a place in a little seate joyning to the pillar where the pulpit standeth'. Later on, as a married man, he and his wife occupied seats in the 11th pew of the middle aisle (1704) and later still (in 1711) were allotted seats for life in the 9th pew on the north side of the middle aisle. We can assume he arrived in Warwick as a fully-trained craftsman, for already in 1670 he was paid for repair work on the church clock, together with Edward Tipping. This implies not only that he was thought capable of being trusted with such work, but also that there was no existing clockmaker in Warwick capable of it. This probably means, as we often see with clockmakers who moved from one place to another, that Nicholas moved to Warwick in 1670 not by chance or on a mere whim, but because he could see an opening in the trade there. Edward Tipping was a smith, who had worked on the church clock himself in earlier occasions since 1663, and was even paid an annual fee of £2.00 for looking after the clock for that very year (1670). We can deduce that Tipping was struggling to cope, and so Paris was brought in, initially to assist and ultimately to take over. An earlier clockmaker, John Wise, had worked on the church clocks at Warwick from 1653 till 1668. Wise was an expert clockmaker of the best kind, but his stay in Warwick was short-lived. He was born in Banbury in 1624, a cousin of Joseph and John Knibb, and therefore also of their cousin Samuel Knibb, who was born about the same year as Wise. He was apprenticed in 1638 in London through the Clockmakers' Company to Peter Closon, and freed from apprenticeship in 1646. By 1653 he had moved to try his hand in Warwick, where, over the years, his wife gave birth to several children. The Wise family returned to London about 1669/70 - we know he was there by March of 1670. Samuel Knibb had already set up there and Joseph was soon to follow him, and it may have been that John Wise, like his cousins, thought his prospects were far more promising in the capital. Although he worked on several church clocks in Warwick, no domestic clock is known to survive made by John Wise from his Warwick period. It may have been the removal of John Wise to London that gave Nicholas Paris the opening he wanted. This means that Nicholas Paris is the first clockmaker to work in Warwick by whom any work survives. In fact he is also the first in the whole county of Warwickshire. 1. Lantern clock by Nicholas Paris in Warwick Museum. Converted from centre verge to anchor escapement, alarmwork removed, hand not original. Picture courtesy of Warwickshire Museums Service. Shortly after Nicholas was settled in Warwick, one Samuel Paris arrived, perhaps his younger brother. He is first recorded there in 1674, and he too carried out repair jobs on local turret clocks. Samuel outlived Nicholas, dying in 1719. No household clocks seem to be recorded by Samuel, which is exactly what we would expect if he worked under his older brother, as Nicholas's name would take precedence as master of the business. Though Nicholas had been working in Warwick since 1670 and Samuel since 1674, it was not until 1684 that they became Freemen of the Blacksmiths of Warwick. Strictly speaking they were not allowed to set up shop there till they had the freedom to do so - but perhaps they did anyway, as incomers often regarded local rules as being there to be broken. Bill Seaby wrote a monograph, 'The Parish Family of Warwick', in which he quotes numerous instances of Paris being paid for repair work on turret clocks, household clocks, guns, locks, keys, water pumps, fire engines, chancel screens, iron gates, bells, gilding work, enamelling .... both by local families and by the corporation of Warwick and other local towns. Clearly Nicholas was a man of quite exceptional talents. Regarding his clocks, very few are known. Warwick Museum has an eight-day eleven-inch longcase clock with ringed winding holes and twin-cherub spandrels, said not to be in its original case. Two bracket clocks are known - one bought in a sale in Switzerland in 1965, the other, an ebonised one with a pierced basket top, was purchased in Worcester many years ago and last heard of in Cornwall. The museum owns a lantern clock, bought at a house sale in Northamptonshire in 1973. It was originally made with a verge escapement and pendulum swinging between the trains, what we often call a centre-swinging pendulum, but it was later converted to anchor escapement and long pendulum, as many were, which meant its alarmwork was in the way and had to be removed and therefore was lost. A second example came to light recently, pictured here, of the same type but which is much more complete, as it still has its original centre verge pendulum and its alarmwork. Bill Seaby quotes details from several original documents concerning gunmaking, gun repairs, the railings to the Leicester tomb, he St. Mary Chancel screen, and gates at Stoneleigh, which still exist. Several guns and pistols, some in the museum collection. In the 1680s Paris undertook the re-gilding of the Richard Beauchamp monument of about 1450 in St. Mary's church. Several letters survive to his patron, Sir William Dugdale, asking for more money as the cost of the work ran way beyond initial estimates. More than once, he pointed out, he had been seriously ill from the poisonous vapours given off in the gilding process, known a fire gilding or mercurial gilding. This is a process no longer practiced today, as, even though wearing a protective mask, those performing it were ultimately killed by the fumes. 'it hath cost me allmost my life twise about the doing of it as the Doctors will aferme, and it hath cost me more mony out of pocket than I have received ....' It may well have been that his life was shortened on account of mercury poisoning. Nicholas Paris seems to have concentrated more on clock making and repairing in his earlier years, and today it is more for his gunmaking and ironwork that he is best known. His sons continued the business, Thomas being still working in the 1740s. 2. The second, recently-discovered lantern clock by Nicholas Paris with original centre verge escapement and original alarmwork and hand. At one time Nicholas had an apprentice named Richard Rittle. Bill Seaby quotes a record of Easter 1682 when Richard Rittle the elder of Over Whitacre, gunsmith, was fined for 'retaining' Richard Rittle the Younger, the apprentice of Nicholas Paris'. Just what is meant by 'retaining' is uncertain - does it mean employing him or does it mean keeping him there against his will? Either way it is apparent that he was in his father's service when he should have been working for Paris, as his apprenticeship was still not ended, and that Paris was so annoyed about it that he took the father to court. Oddly enough a few years ago I had a lantern clock signed charmingly and a little amateurishly 'R. Rittle fecit me', with no place name. From its style we could date it to the early 1680s, so it is probably too early to have been made by the younger Richard Rittle, Nicholas Paris's apprentice, even if he did ever finish that apprenticeship. The Rittle name was totally unknown in clockmaking at that time, and even now all we know about R. Rittle is from Bill Seaby's report of court proceedings of 1682. A little research on my part established that Richard Rittle senior, the gunsmith, and his wife Katherine, had several children baptised at Over Whitacre in the 1660s-1670s. One of this name who would seem to be Richard Rittle junior, that is Nicholas Paris's apprentice in 1682, was married in 1697 and himself had a child named Richard in 1698. The point of this is that it would seem to be certain that the lantern clock was made by Richard Rittle senior. More about the lantern clock later. Returning to Nicholas Paris and his clocks, the most surprising thing that strikes me about them is that they are so very few in number. Where are they all? This man was in business for at least forty-six years, and he had additional help in the form of a supposed brother (Samuel), three sons, and at least one apprentice, and yet his total recorded output is five clocks? And that number of five clocks is the combined total of those recorded by every clock researcher for the past century or so! That is an incredibly low output. So little-known as a clockmaker was Nicholas Paris, that his name fails to appear at all in the standard lists of makers by such compilers as Baillie and Britten - and they have been gathering these names together for a hundred years now! Bill Seaby seems to have been the first to document him in 1981, after which he appeared in my own extended compilation of Baillie in the revised edition of 1989. We know a clockmaker working alone could produce one clock every two weeks, twenty five clocks a year. If he worked alone Nicholas Paris could have produced about 1150 clocks, yes, well over one thousand, even without assistance! Given that some will have been destroyed and that we may only record a fragment of his surviving works, the number known today is still negligible. If we compare this with other clockmakers who numbered their clocks, we can see this is totally unrealistic. Will Snow of Padside in Yorkshire numbered his brass dial clocks only and these total at least 1,300 (plus an unknown quantity of un-numbered painted dial clocks) made during his working life of forty years (at least thirty-two clocks a year). I have personally recorded over one hundred clocks by Snow and I come across at least two or three previously-unrecorded ones every year. The reason can only be that Nicholas Paris was first and foremost a maker of guns and ironwork, and that clockmaking formed a very small part of his business, probably as Bill Seaby suggested, in his earliest years, when he was struggling to establish himself and would therefore take on a greater variety of work. It is interesting to be able to compare the lantern clock by Richard Rittle with the two lantern clocks by Nicholas Paris. What can we deduce from an examination of them? They are of about the same age, made in the early 1680s, Rittle's perhaps slightly later than Paris's, but are as different as chalk and cheese. Of course, the Rittle clock was converted years ago to a spring drive movement with two hands, and so all we have to compare with the Paris lantern clocks is the outer case, but that is enough to reveal how very different the work is. Rittle and Paris used different suppliers of castings and different engravers - whether each did his own engraving we cannot say for certain. However because we can compare them with known engraving styles I think it very unlikely that Rittle did his own engraving, and unlikely that Paris did (apart from his own name perhaps). To a beginner lantern clocks all look very similar, though when you get down to the detail they are far from similar. One source says that all makers used pretty well the same brassfounders' castings for lantern clocks - I have established for myself that this is far from correct. For some years now I have delighted in measuring the castings of lantern clocks I have handled - pillar height, plate width and depth, chapter ring diameter and width. This is the sort of pathetic amusement we antique clock eccentrics brighten our lives with, those of us would have found a career in accountancy too exciting! Such measurements prove for a fact, in the case of these two clockmakers, what is the apparent position visually, namely that the two are very different! Something strikes me as distinctive about Nicholas Paris's lantern clocks. The museum clock is probably the earlier of the two, and that has something especially odd about it. It is signed very eccentrically in a way I have never seen before on any lantern clock, in that the engraving is cut into the junction of the four pillar tops and bases, using that pathetically shallow space offered by the finials and feet. This makes for very cramped work. Why engrave his name in what must be the most difficult position it was possible to choose, having to cut into three different contacting layers of brass, which are barely on the same level? Engraving is a difficult enough job on a flat smooth surface, and it is little short of a miracle that he achieved such an excellent result. Whoever he was, the engraver must have had a real struggle - the air was probably blue! 3. The lantern clock by Richard Rittle, very different in style from those by Nicholas Paris, showing the different origin of the castings. The answer is that Paris bought in either the complete clock (complete with pre-engraved dial), or bought in the castings for a standard unsigned clock, as often supplied by specialists to the trade at this time, and this left no space in which to sign his name. The foliate pattern of fret chosen has a very narrow lower rim, barely deep enough to carry engraving. Yet he wanted his name there for all to see, as clockmakers were not endowed with a natural modesty. The result was that he had to sign it in this ridiculously difficult place. On the more recently discovered clock, it is again one which is fully engraved, but here Paris opted for a different fret, a dolphin pattern, which did have a slightly deeper lower rim, into which he has just managed to squeeze his signature. This is further evidence that the museum clock is slightly the earlier of the two, as he would not make this same mistake twice. Both lantern clocks are typical London-style lantern clocks of the late 1670s or 1680s, designed to carry a centre verge pendulum , which came in about that time. The purpose of the centre verge pendulum was to leave room at the back for alarmwork, as a verge pendulum at the rear would have prevented alarmwork being fitted. Paris bought the clock castings from London, the capital of the lantern clock world, and would have done the finishing, assembling and probably the engraving of his name in his own workshops. It is unlikely he bought them as ready-finished lantern clocks, as they would have been too expensive for him to re-sell. The profit was in the amount of work he could put into them himself - but he was not set up to produce the castings themselves. How do we know they came from London? 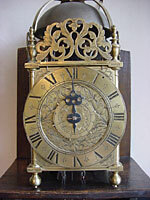 The style of each clock, proportions, engraved patterns, chapter ring engraving, are all pure London - but most clinching of all, all the castings are of standard London size: pillar height 10.25 inches, plate width and depth 5.75 inches, chapter ring diameter 6.5 inches, chapter ring width 1.25 inches. From my list of measured clocks I can pick out identical frame sizes on clocks by Thomas Knifton of London 1650s, Richard Child of London 1640s, Nicholas Coxeter of London 1660s-died 1679, John Ebsworth of London successor to Coxeter 1679-1699, and other unsigned Lothbury lantern clocks, as well as a few signed by provincial makers, who obviously bought London castings. It may be pertinent that Knifton and Coxeter were two of the most prolific makers of lantern clocks of all time, who themselves would certainly have supplied others in the trade. Richard Rittle's style is very different. The lantern clock dial has an engraved centre style based ultimately on Bristol work and so resembling clocks made in the 1680s by Edward Webb of Chewstoke (Somerset), in the 1660s-1680s by Thomas Veale of Chew Magna (Somerset). It might date fractionally later than Nicholas Paris's clocks. Rittle's castings are smaller but wider - pillars 10 inches, plates 6 inches square, chapter ring diameter 6.25 inches, chapter ring width 1.5 inches. What is more his pillars have the finials and feet in a continuous, one-piece, solid casting, which was West Country practice, and was not done London. Apart from the very different engraving style, Rittle's clock castings are from a totally different source from Paris's. I have few measured examples of West Country lantern clocks, but one by Thomas Wroth of Wellington has the same frame as Rittle's. As yet there was no 'Warwickshire' lantern clock style as such. These men were making the very first ever made in that county and had to source their materials, castings and engraving where they could. Nicholas Paris was a pioneer, whose work is of exceptional interest to the student. The scarcity of his lantern clocks makes them of extraordinary interest to the dealer or collector. When scarcity means 'limited to two examples', it is lucky then that we can draw any conclusions at all about it. Perhaps another example will one day come to light. I, for one, will be looking out for one.